Tony Bennett’s life and philosophy is the embodiment of the Great American Story. As he approaches his 90th birthday in 2016, his career as the pre-eminent singer of the 20th and 21st centuries is unprecedented. He continues to be embraced and loved by audiences of all generations. Through his dedication to excellence and his insistence on quality, he has become the keeper of the flame by extolling the virtues and values represented by the Great American Songbook. Tony Bennett has been on the front lines of every major issue impacting the cornerstones of this country’s modern history. He has performed for eleven U.S. Presidents, is a World War II veteran who fought in the Battle of the Bulge and participated in the liberation of a concentration camp, and marched side by side with Dr. Martin Luther King in Selma to support civil rights. Throughout his life, Tony Bennett has been a dedicated pacifist and proactive humanitarian selflessly supporting many causes whose goals benefit the lives of millions. His love for his country has earned him the distinction of national treasure and United Nations has named him a Citizen of the World as one of their foremost ambassadors. No one in popular American music has recorded for so long and at such a high level of excellence than Tony Bennett. In the last ten years alone he has sold ten million records. The essence of his longevity and high artistic achievement was imbued in him in his loving childhood home in the Astoria section of Queens where he was born on August 3, 1926. His father died when Tony was 10 and his mother, Anna, raised Tony and his older brother and sister, John and Mary, in a home surrounded by loving relatives who were Tony’s first fans filling him with encouragement and optimism. He attended the High School of Industrial Arts in Manhattan, where he continued nurturing his two passions, singing and painting. From the radio he developed a love of music hearing Bing Crosby, Louis Armstrong, and James Durante. With millions of records sold world-wide and platinum and gold albums to his credit, Bennett has received eighteen Grammy Awards — including a 1995 Grammy for Record of the Year for his “MTV Unplugged” CD which introduced this American master to a whole new generation — and the Grammy Lifetime Award. 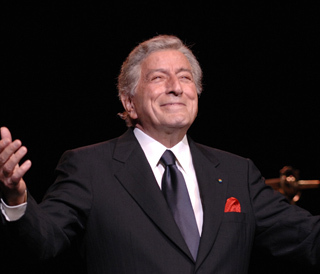 His 2007 prime-time special, “Tony Bennett: An American Classic,” won seven Emmy Awards. His initial successes came via a string of Columbia singles in the early 1950’s, including such chart-toppers as “Because of You,” “Rags to Riches,” and a remake of Hank Williams “Cold, Cold Heart.” He had 24 songs in the Top 40, including “I Wanna Be Around,” “The Good Life,” “Who Can I Turn To (When Nobody Needs Me)” and his signature song,” I Left My Heart In San Francisco,” which garnered him two Grammy Awards. Tony Bennett is one of a handful of artists to have new albums charting in the 50’s, 60’s, 70’s, 80’s, 90’s, and now in the first two decades of the 21st century. He has introduced a multitude of songs into the Great American Songbook that have since become standards for pop music. He has toured the world to sold out audiences with rave reviews whenever he performs. Bennett re-signed with Columbia Records in 1986 and released the critically acclaimed The Art of Excellence. Since his 1991 show-stopping performance at the Grammy Awards of “When Do The Bells Ring For Me,” from his Astoria album, he has received a string of Grammy Awards for releases including Stepping Out, Perfectly Frank and MTV Unplugged. In the new millennium, Bennett’s artistry and popularity was higher than ever. In 2006, the year of his 80th birthday, his Duets: An American Classic was released. The album—which included performances with Paul McCartney, Elton John, Barbra Streisand, Bono and others—won three Grammy Awards and went on to be one of the best selling CDs of the year and Tony’s career. Bennett’s first Duets album also inspired the Rob Marshall-directed television special Tony Bennett: An American Classic which won seven Emmys making it the most honored program at the 2007 Emmy Awards. In celebration of his 85th birthday in 2011 the release of Bennett’s highly anticipated, Duets II, featured Tony performing with a new roster of celebrated artists including, the late Amy Winehouse (her last recording was their duet of “Body and Soul”), Michael Buble, Aretha Franklin, Josh Groban, Lady Gaga, John Mayer, and many others. Duets II debuted at #1 on the Billboard Album charts, making Tony the only artist at the age of 85 to achieve this in the history of recorded music. Bennett won two Grammys for Duets II in the 2012 Grammy ceremony and this year marked the 50th Anniversary of the recording and release of his signature song, “I Left My Heart in San Francisco.” A documentary entitled, THE ZEN OF BENNETT, which was created and conceived by Danny Bennett, Tony’s son and manager, was premiered at the Tribeca Film Festival 2012. At the end of 2012, Bennett also authored his fourth book, the New York Times bestseller, LIFE IS A GIFT, which highlights his personal philosophies learned throughout his life and career. Tony’s latest endeavor is a collaborative jazz album with Lady Gaga, released this September, titled, Tony Bennett & Lady Gaga: Cheek To Cheek. Cheek To Cheek debuted at #1 on the Billboard Top 200 album charts making Bennett, at the age of 88, the oldest artists to have a #1 album – a record he originally established at the age of 85 when his Duets II debuted at #1. Cheek To Cheek won a Grammy in the Best Traditional Pop Vocal category. Tony Bennett became a Kennedy Center Honoree in 2005, was named an NEA Jazz Master in January of 2006, a Citizen of the World award from the United Nations and a Billboard Magazine Century Award in honor of his outstanding contributions to music. Tony Bennett is a dedicated painter whose interest in art began as a child. He continues to paint every day, even as he tours internationally. He has exhibited his work in galleries around the world. The United Nations has commissioned him for two paintings, including one for their 50th anniversary. His original painting, “Homage to Hockney,” is on permanent display at the Butler Institute of American Art and the landmark National Arts Club in New York is home to Tony’s painting “Boy on Sailboat, Sydney Bay.” Three of his paintings are part of the Smithsonian Museums permanent collections including his portrait of his friend Duke Ellington that became part of the National Portrait Gallery’s collection in 2009. In 1999, Tony Bennett, with his wife Susan Benedetto, a former public school teacher, founded Exploring the Arts (ETA) to strengthen the role of the arts in public high school education. ETA connects private funders, individual artists, and cultural institutions to Partner Schools to achieve greater equality of resources and opportunity for youth of all means and backgrounds. ETA programs are designed to help school principals and teachers sustain the arts in the face of budget cuts and better leverage the arts to strengthen student learning and engagement. ETA’s first endeavor was the establishment of Frank Sinatra School of the Arts (FSSA), a public high school founded in 2001 by Tony and Susan in partnership with the NYC Department of Education. FSSA is housed in a newly constructed building in Tony’s hometown of Astoria, Queens. Its state of the art facilities include visual art studios and a gallery, black box theatres and a stagecraft workshop, dance studios, choral and orchestral classrooms, an 800-seat concert hall, a multi-media technology lab, and a rooftop performance garden. All students major in Dance, Theatre, Film, Fine Art, Vocal or Instrumental Music. FSSA also offers a rigorous academic curriculum and holds one of the highest graduation and college enrollment rates for NYC public high schools. ETA continued beyond its commitment to FSSA to expand their support and o date, ETA currently partners with 17 public high schools — 14 in all five boroughs of New York City and 3 schools located in East Los Angeles and expansion plans to serve more schools are underway.